I will admit that for this month’s OT challenge book I wanted something short. I was going to read something else from my list, but I was in Sherman’s the other day and the lovely cover art and oh so thinness of this book called out to me. It also looked pretty interesting. Besides, I had already decided NOT to read Love in the Time of Cholera, but hadn’t yet picked another title by Marquez. This strange and sad book consumed me during a slow shift at Reel Pizza Cinerama. In five chapters the mystery of the death of Santiago Nasar at the hands of the Vicario brothers is explored, but ultimately not solved. The narrator, coming back to his village after many years, seems to be journalistically searching for the truth. He offers opinions, but for the most part the story is reported through others. 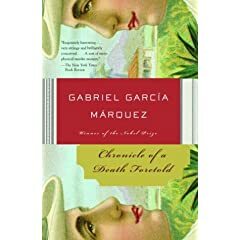 When Angela Vicario is returned in disgrace to her family on her wedding night, she names Santiago as her lover and her brothers set out to murder him for dishonoring her. Everyone in the village agrees about that. But why, if everyone knew the murder was going to happen, did no one try to stop it? The book is fascinating in it’s details, even as these details tantalize with what they do and do not reveal. The more you learn about the events that wrap the death of Santiago Nasar, the less you’re certain of. The village and it’s people pop into vivid life, and yet the prose is so simple that it all seems like a mirage. Oddly humerus and yet horrifying, with a dreamlike question about the hurt a man’s own heart can cause him, this book served as an easy but enthralling introduction to Marquez’s world. I read this a long time ago and liked it, but I think I could profit from reading it again sometime soon. Nice review! P.S. I’ve picked up three other Colombian titles recently (inc. García Márquez’s nonfiction “Noticia de un secuestro,” which is sometimes claimed to be the flipside of “Chronicle”), but now I just need to find the time to read them all. Too many books, too little time. I love your new banner, by the way, so spring-y! My OT book this month I’m reading right now, and it’s a bit long, over 500 pages. Half of a Yellow Sun. I’m really loving it. Oooh, I love a good “the more you know, the less you’re sure of” story! I’ll have to check this one out.